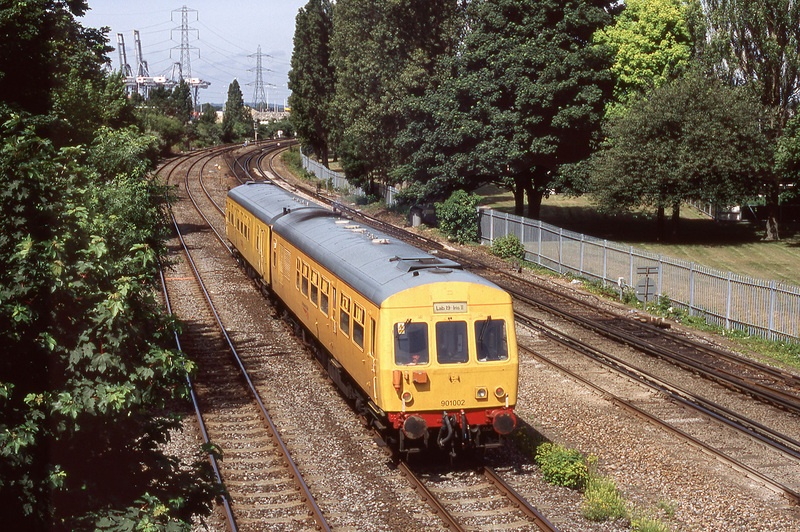 These Units built at Washwood-Heath in Birmingham by Metro-Cammell from 1956 to 1958 and survived until 2003.Many are retained in Preservation. Lab 19 (Iris 2) Class-101 twin 901002 formally 53222/53338 trundles past Millbrook in Southampton on Network Rail video survey work. 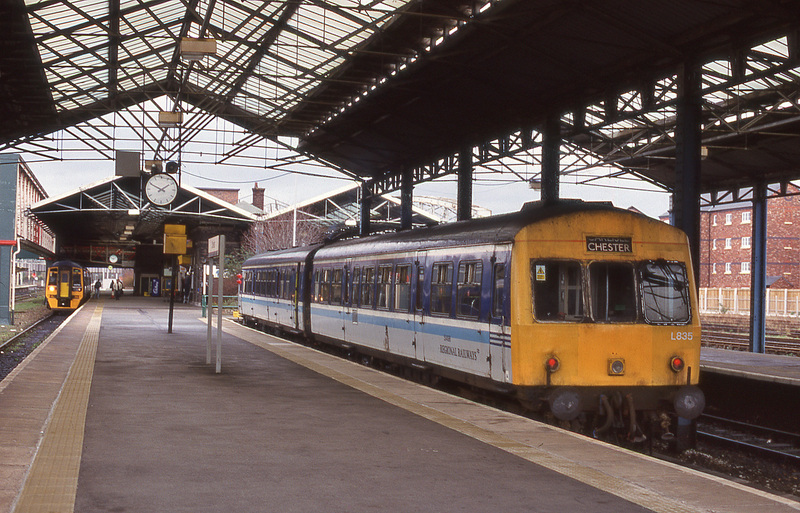 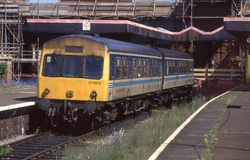 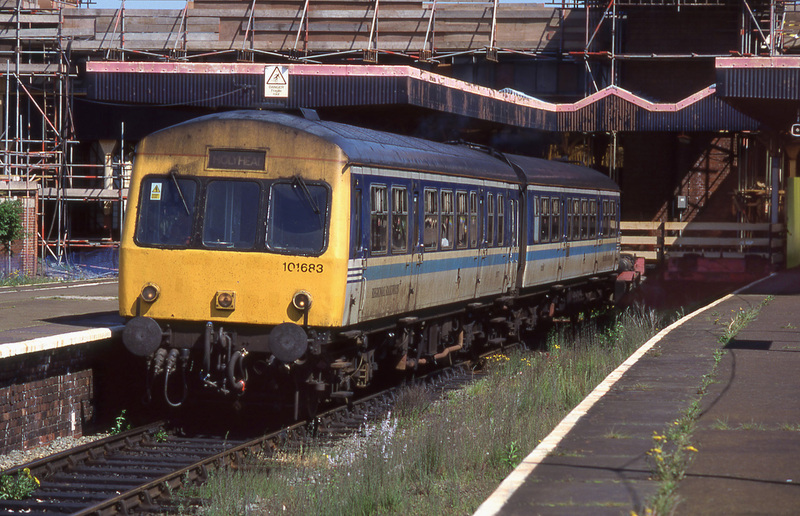 The Unit lasted in service until early 2008 when it was sold for preservation to the West-Somerset-Railway.However it moved on in the Barry Rly in 2009 where it still is in 2013. 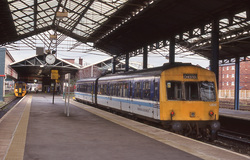 Power-Twin Class-101 Set L835 comprising of 51498 and 51432 stand parked up in the bay platform at Chester Station.Not long after this picture was taken this pair were withdrawn and ended up stored at Shoeburyness for many years.It was the last DMU stored there when it was moved to the Swanage Rly seemingly safe into preservation.However ownership disputes and subsequent court cases plus it having been partially stripped for spares rendered it unloved and unwanted.It now awaits scrapping.Stored as of Nov-2013 at Swanage. Wearing the then current livery of 'Regional Railways' 101683 rounds the severe curve complete with 'check-rails' on the approach to Deganwy Station on the short branch from Llandudno Town up to the mainline at Llandudno Junction in North-Wales. 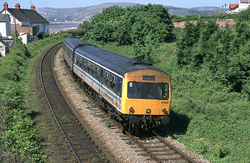 Metro-Cammell Class 101 101683 stands in the rather dilapidated Llandudno Town Station with a stopping service bound for Holyhead (Via Llandudno-Junc).Until fairly recently this had been running around as a 3-car but around this time all the centre coaches left in use (2) had been withdrawn leaving the remaining operating 101's in the area as Power-Twins.